Six years ago, you'd have been hard pressed to find anyone who knew what an app was. Now that's all changed and there are more than a million app choices in our super cyber-spaced world, covering a dizzying array of subjects. Hundreds and hundreds of them are business-, finance- and investing-related. And the number of apps has grown at warp speed. In 2008, when the iPhone Apps Store was launched, it offered about 800 apps. By October 2013, the number had swelled to more than 1 million -- and was still growing. The reasons people enjoy these utilities range from professional to personal. "Oh goodness, I couldn't live without my iPhone," said Caroline Harless, co-founder and general partner of the certified public accounting firm Harless & Associates in West Palm Beach. She uses work- and business-related apps more than those designed for pleasure. "I go to CNBC all of the time, and that's very important to me for a variety of reasons from reading the headlines to watching the market, " she said. Like most app users, Harless uses company online websites as well as content-related apps. Although it's easy to confuse the two, websites and apps aren't identical. The differences center on functionality. Unlike a website that merely displays pages of information, apps are intended to have its users to do things such as play a game, pay a bill, or invest. 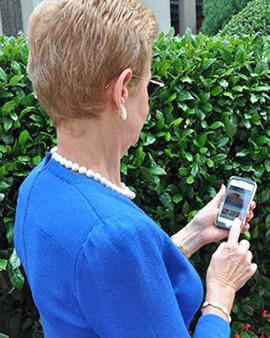 Jo Ann Engelhardt, managing director at Bessemer Trust, prefers not to use business apps, but she is a fan of HopStop. "When I'm visiting our headquarters in New York City, it's the best way to learn how to travel around the city." Tom Walker, president of First Palm Beach Advisory Co., uses a variety of sites from ESPN to CNBC and Schwab. But when it comes to utilizing the best business and finance resource available, he chooses just one: "Bloomberg, because they are so darned good." And he's right. One of the most popular free and easy-to-use apps for anyone who wants to follow the market and all things investment-related -- from news to prices of stocks, bonds, commodities, currencies etc. -- is Bloomberg's iPad app. One site, iPad Apps Reviews, estimates the app has 300,000 professional users. Like Walker, Thomas J. Herzfeld, one-time resident and closed-end guru, is also a fan of Bloomberg. He uses his iPad and iPhone to tap into Thomson Reuters for data, as well as CNBC and CEF (Closed End Fund) Connect. "They're all good, but the one I use the most is CEF Connect," said Herzfeld. 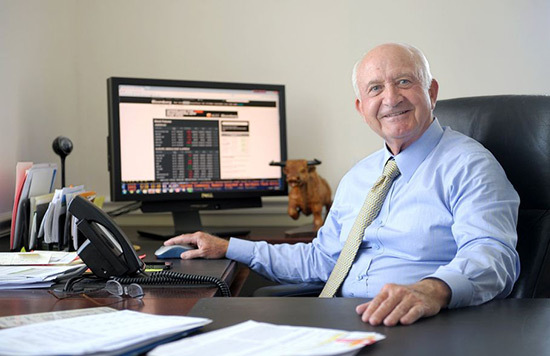 "It gives you the net asset values of closed-end funds and I use it all day long." Whether for your cellphone or tablet, apps do allow users to save time and retrieve more information on a subject than anyone could have imagined a decade ago. It's been estimated that 15-20 percent of retail trading is now being conducted on mobile devices and that usage is only expected to grow. In a recent Barron's story, Ram Subramaniam, president of Fidelity Investments, said: "It's clear that the devices we use, and the ways that we use them are fundamentally changing, and that provides investors with room for growth, limited only by the creatively of the tools we provide." Even though industry experts report that the growth of apps is on a upswing, just as the number of dot.com companies skyrockted and then fell to earth, some say that the app bubble could burst as well. If that were to happen, the pros think what's likely to remain are the best, most functionable and popular apps. In the meantime, one Palm Beach pro reminds investors not to overlook a company's website. While a fan of all things mobile, digital and Apple-related, Robert Harvey of Harvey Capital Management may use apps on his iPhones and iPads, but when it comes to researching stocks, websites provide the best information. "The best place for individual investors to go look (for information) is right to the company," said Harvey. "Visit their website, read their press releases, listen to their audio conferences and programs. Do that and you've have the tools to make some good investment decisions." While the lion's share of apps are games and entertainment-oriented, the iTunes App Store has more than 300 finance-related apps available to download. Many are free; others will cost a few bucks with a few costing many bucks. Investing apps that typically make someone's " Best" lists include Bloomberg Mobile, E-Trade, ShareBuilder, Shares2, StockMarket Pro, TD Ameritrade, Wikinvest and Yahoo Finance. Commodities fans might like BlackGold, for oil, gas, gold and silver tracking. Mortgage Calculator is considered the No. 1 free mortgage calculator. Overview: Downloading the Bloomberg financial app from iTunes is a snap. Taking advantage of all the data included in it, will take much longer. This app is filled with data that first-time investors may find overwhelming at first glance. But after navigating the site, users may find this could be the one-and-only financial/investing resource they'll need. Data: Home-page users can follow index performances from around the globe along with futures, bonds, currency and commodity prices reflecting their performances for one-day, one-month and 52 weeks. Videos and streaming news is available too. Move to NEWS and tabs include Worldwide, Exclusive, Economy, Opinion, Technology Luxury, Entrepreneurs and Markets. Visit the WATCHLIST section to follow your choice of securities. Problems: Quick tour of app didn't work after I downloaded and opened the app.